School has started and the nights are cooler, which means fall is here! One great DIY project for you tackle this time of year is kitchen cabinet remodeling. Why this time of year? For starters, hotter weather can lead to difficulties with resurfacing or painting. Minnesota’s lovely fall weather thankfully takes care of that concern. And you likely have more time on your hands now that the kids are busy with homework and other activities. So pull up your sleeves, pull out that elbow grease, and get to work! You’d be surprised at how these small kitchen hardware upgrades can really change a room. Just remember – if you swap out old knobs and pulls for new ones, also do the same for your hinges! One of the latest trends to hit kitchen design is the painted cabinet. Such cabinets add a pop of color to what can otherwise be a big block of wood. What’s great about this option is that you can incorporate more than one color, when done correctly. Colors that are sure to be a hit according to style magazines and paint pros like House Beautiful and Behr include Grecian Blue, Orange, Olive Green and pastels of any color. When a simple coat of paint isn’t enough to take care of your aging, cracked or scuffed cabinets, then it is time to consider a full refacing project. This requires sanding the boxes down and most likely replacing the doors. Going this route enables you to embrace many of the benefits of a true remodel while only costing a fraction of the price. Cabinets Too Far Gone for Refacing? Call Us for a Remodel! If your cabinets are too worn, broken or outdated, it might just mean it is time for you to take that step and pursue a professional kitchen cabinet makeover. At Artisan Cabinet Co., we take the makeover one step further by building beautiful, custom cabinets that truly fit your home and your lifestyle. So if one of these DIY kitchen cabinet remodeling ideas just won’t work due to your existing cabinets, reach out to us. We can help you design, build and install the cabinets of your dreams! Call us today at 952-737-7088 or connect with us online to learn more. 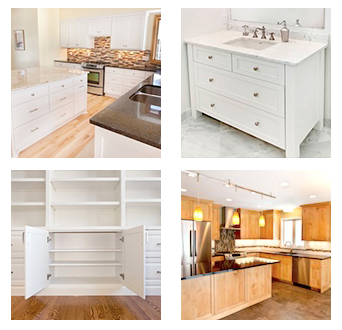 Why Choose Artisan Cabinet Co. for Custom Cabinets in Minneapolis? Which Style of Kitchen & Bathroom Cabinets Suits You Best?